Published in the US as "My Father's Daughter" (2011). This is my new go-to vegetable stock. The tarragon adds lovely flavor! Delicious! I add a little less white miso now as I found it a little overwhelmingly salty the first time I made this. I add an additional teaspoon or two of maple syrup. Used striped bass and it was still AMAZING. I am feeling very uncharitable feelings toward Ms. Paltrow at present. This is the recipe that has taught me that I do NOT know how to pound meat. I have shredded bits of chicken all over my kitchen counter at present. And two VERY small residual chicken breastlets to milk and breadcrumb for our dinners, once the cherry tomatoes have finished roasting. Hmph. Phooey, I say. Also, needs to be more aggressively seasoned than I managed. Maybe salted a couple of days in the fridge, per zuni cafe cookbook? I really liked this recipe. It's a great way to use up extra kale and get it in the kids. The soy sauce makes this dish, it brings all the flavours together and makes it yummy. Will make again! A good dish, but not a wow. Makes for a healthy side to grilled chicken and veg. Very tasty - and nobody realized they were vegan. I particularly liked the crunchy topping. I was very skeptical, but these were delicious and the kids loved them too. I used regular milk, and I had to use more agave for some of the maple syrup (I ran out) but otherwise I followed the recipe. I'm sure they're delicious as written too. It is one of those real comforting cookbook reads you can take to bed. 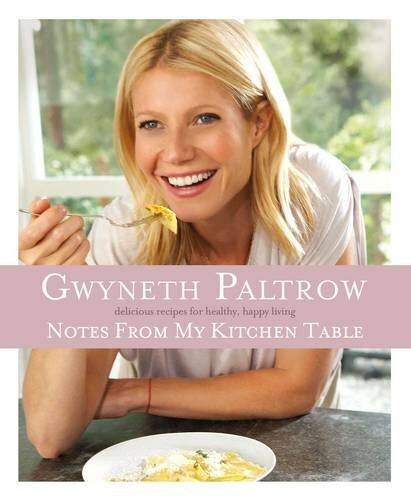 Real home cooking with a lovely introduction where Gwyneth talks about her family and how her love of food grew.